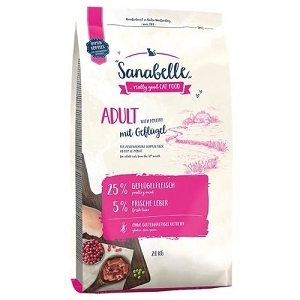 Sanabelle Grande+ delivers high quality protein packed in the gluten-free kibble with great taste. Rich in natural chondroitin and glucosamine to support and maintain bone cartilage. Formulated for a bigger better built. Sana Belle Grande was specifically for adult cats large breeds. The unique large Krokettenform, the feeding behavior of the big cats in an ideal way prevent and reduce the risk of food intake. Because of this positive feature is Sana Belle Grande also suitable for smaller cats, especially if they become a hasty feed intake to tend. The Krokettengröße and the special nature stimulate the cat to slow down, severe mechanical crushing of food. The specific components naturally contained cartilage building materials (such as glucosamine) interfere with the metabolism of the articular cartilage and support the mobility of the joints (cartilage care). Therefore suitable Sana Belle Grande excellent food for your adult cat. Buy 1 bag of 2kg & get a free 400g (up to $6.90) &Sanabelle (limited edition) Tin worth $9 (subject to stock availability) FREE!!! Flavour is bundled up, may not be the same type. Poultry meat meal, corn, barley, animal fat, salmon meal, meat meal, liver flour, Fleischhydrolysat, whole (dried), rice, spelt, cellulose fibers, dried beet pulp, linseed, yeast (dried), fish oil, potassium chloride, cranberries (dried), blueberries (dried), Mussel meat meal, Chicoreepulver, marigold blossom (dried), yucca extract.